Phenderix Magic World adds a massive amount of content to the game including new spells, weapons, bosses, followers, locations, and much more! Download today to unleash hundreds of new roleplaying options and discover a new world where magic has just begun to awaken. phenderix - created all content not mentioned below. Skyrim Nexus User: 747823 - Weapons of the Third Era - meshes and textures used for several items contained within this mod. Awesome work! Skyrim Nexus User: lolikyonyu ﻿- Lolicept Resources﻿ - clutter items that make locations much more interesting. Thanks for this resource! 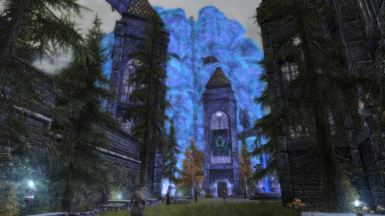 Skyrim Nexus User: Sjogga - created a large portion of the main hall interior for the School of Witchcraft and Wizardry. Skyrim Nexus User: Timmy19992 - assisted in creating part of the exterior for the School of Witchcraft and Wizardry and creating texture files. Skyrim Nexus User: HellCommander711 - assisted in creating old version of navmeshes. The SkyEdit Team - You made a fantastic program! You allowed me to start making mods in 2011 before the official creation kit was even released! Bethesda Softworks - You created an amazing game that stands the test of time and made what I believe to be the best game of all-time. Content: Spell "Elemental - Concussive Strike". Content: Merged Touch/Telekinetic spells to create "Channel" spells. Improvement: Significant enhancements to appearance and detail of area north of Manantis town. 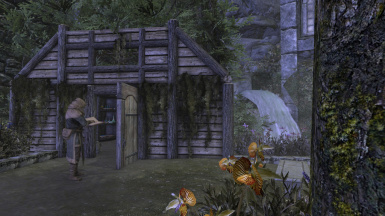 Improvement: New clutter, flora, trees, items, and objects in the area north of Manantis town. Improvement: New loot chests in locations added by this mod to encourage exploration. Improvement: Slight changes to Manantis town and interiors. Balance: "Channel" spells do initial extra damage if the caster is close to a target. Misc: Spell "Rune - Deplenish" renamed "Rune - Exhaustion"
Misc: "Telekinetic" spells renamed "Channel" spells. Misc: Renamed potent spells and assigned them to Fire, Frost, and Lightning archetype categories. Misc: Background work on a massive undertaking to improve spells added by this mod. 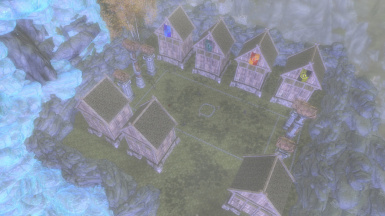 Improvement: Significant enhancements to appearance and detail of Manantis town area. Improvement: New clutter, flora, trees, items, and objects in Manantis town area. Improvement: New loot chests and additional hidden items in new locations added by this mod to encourage exploration. Bug Fix: Deleted random tower at Fort Skull Lookout. Misc: Bethesda.net PC and XB1 versions will be simultaneously updated going forward. Bug Fix: Fixed BSA file. It should properly work now. Content: Ammo Legendary Arrow/Bolt Blink Strike. Improvement: Massively improved frost spells with properly functioning movement and weapon speed slowing effects. Improvement: Frost ammo now has slow functionality. Improvement: Glacial Strike ammo now has slow functionality. Improvement: Gate spell effect functionality and descriptions. 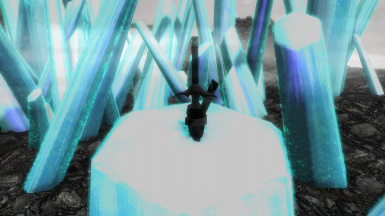 Balance: Major functionality changes and updates to Frost spells. Balance: Nerfed Frost archetype spell damage. Improvement: Added additional detail and clutter to "The Wall". Improvement: Added working ladders to "The Wall". Bug Fix: Fear and Frenzy arrows have been altered and now work properly. Misc: Replicate ammo is now classified as a legendary ammo. Misc: Slight changes to several legendary ammos. Misc: Removed spell "Summon - Cow Painted". Content: New Ammo Legendary Arrow/Bolt Glacial Strike. Content: New Ammo Legndary Arrow/Bolt Inferno Blast. Content: New Ammo Legendary Arrow/Bolt Eternal Black. Improvement: Custom Arrows now all use vanilla meshes and textures found in vanilla Skyrim. Improvement: Appearance of Manantis Docks. Improvement: Sound FX for "Divine Healing Blast". Improvement: Updated climate data for Manantis. Bug Fix: "Divine Healing Blast" is no longer a hostile spell. Bug Fix: Fixed ramp position at "The Wall". Bug Fix: Lost Remeglass quest now properly completes. Bug Fix: Prank Book quest now properly completes. Misc: Removed dragons in Manantis. May return in future. Misc: Removed pop-up message at the start of the game. Misc: Removed "Teleport - Forbidden Dimension" spell. Misc: Removed old MCM menu for Magic Transcended. Misc: Removed optional Beauty Patch. Didn't work. Content: Spell "Divine - Concussive Strike". Content: Spell "Fire - Blazebolt (Cheat)". Content: Weapon "Hand - Blood". Improvement: Moved Manantis portal to Manantis Mountain. Optional Files: Released "Phenderix Magic World - Beauty Add-On". Optional Files: Updated "Phenderix Magic World - Lore Friendly Patch". Misc: Renamed Arcane Mountain to Manantis Mountain. Balance: Concussive Strike spells buffed and rebalanced. Balance: Decreased gold value of legendary weapons. Balance: Nerfed several necklace and ring artifacts added by this mod. Balance: Rune Repeater spells now cost more magicka. Bug Fix: Properly placed Brisinblue and Naegrand in correct boss inventories. Bug Fix: Working dialogue and thus working quests. Bug Fix: Luna can no longer be recruited as a follower. Improvement: Updated script for interaction with summons. Bug Fix: Shraken is no longer essential. Bug Fix: Manantis portal linked properly. Content: Ammo "Arrow - Blood" and "Bolt - Blood". Content: Basic text dialogue added for many NPCs. Content: Location "The Chamber of Sircets". Content: Location "The White Cemetery". Content: Location "The Forbidden Forest". Content: Massive expansion of Manantis worldspace. Content: New boss encounters scattered throughout new and old locations. Content: New custom decorations from joceline mod. Content: New interiors and shops at Manantis. All buildings have working linked doors. Content: New unique and generic NPCs in Manantis. Content: New unique dragons with custom textures. Content: NPC "Hergrid". Added to School. Content: NPC "Murtle". Added to Arcane Mountain. Content: Quest "Camp Troy Ammunition". Content: Quest "Templar Resistance" and Templar encampments. Content: Quest "The Chamber of Sircets". Content: Quest "The Lost Food Caravan". Content: Quest "The Perfect Sweetroll". Content: Quest "The Prank Book". Content: Quest "The Stolen Remeglass". Content: Quest "The Sorting Hat". Content: Spell "Magnetism - Pummel". Content: Stable in Manantis. Purchasable horse. Improvement: Custom meshes for hand FX for many spell archetypes. Improvement: Custom sound effects for all "Force - Strike" spells. Improvement: Custom sound effects for all "Lightning - Strike" spells. Improvement: Custom sound effects for all "Time - Analysis" spells. Improvement: Custom textures for all elemental arrows and bolts. Improvement: Custom textures for Brisinblue legendary weapon. Improvement: Every Manantis interior has been enhanced with additional content. Improvement: Exterior Appearance "Arcane Mountain". Improvement: Ladder access to the Arcane Mountain. Improvement: Lair of the Deathbringer encounter. Improvement: More lore-friendly names for NPCs. Improvement: Overhauled Arcane Mountain dragon appearance and pathing to its mouth. Improvement: Overhauled old boss encounters. Many have changed locations. Improvement: Reduced the number of janitors at the school. Improvement: School Dining Hall appearance, clutter, and optimization. Misc: I now manage and keep track of all changes to this mod using Asana. Misc: New MessageBox informing users of how to successfully install this mod. Misc: Official Nexus guide has been trimmed and further edited. Misc: Video trailer for version 2.0.0. Removal: Reduced number of followers added by this mod. Removal: Spell "Charm - Silencing". Removal: Spell "Darkness - Invisibility". Removal: Spell "Divine - Detect Life". Removal: The Forbidden Dimension. Moved boss encounters to new areas. Balance: Some minor changes to spells and arrows/bolts. Bug Fix: "Guild Hall" bed ownership. Bug Fix: Arcane Mountain map marker. Bug Fix: Changed the location of several important school NPCs. Bug Fix: Darkness spell archetype experience issues. Bug Fix: Deleted a floating tree in the Tamriel worldspace. Bug Fix: Divine sorcerers would heal the player during hostile combat. Bug Fix: Excaliblade FX visibility. Bug Fix: Summon ghost warrior. Bug Fix: Can now properly craft Divine arrows and bolts. Bug Fix: Potentially fixed Shruicann flight issues. Balance: Buffed the damage of several Divine spells. Bug Fix: Multiple summons should work properly now. Bug Fix: Summon Dragon descriptions updated. Bug Fix: Removed some unused spell tomes. Bug Fix: Hermione Granier wears a Red House outfit. Bug Fix: Properly added "The One Ring" to "The Chest of the True Adventurer". Bug Fix: Improved pathing in the "Lair of the Prime Evil". Bug Fix: Players are now allowed to explore the interior of "The Commodore". Improvement: "Professor Severius" now sells potions. Custom potions may come in future updates! Improvement: The interior of "The School of Witchcraft and Wizardry" has been optimized and now provides much higher FPS. Improvement: Altered many of the names of many NPCs at "The School of Witchcraft and Wizardry". Improvement: "Arcane Mountain Dragon" LOD and appearance. Balance: Giants in "The Magic Isle" have their level scale with the player's level. Balance: Buffed "Lightning Encounter" boss. Content: Added house elves to the kitchen in "The School of Witchcraft and Wizardry". Content: Added Divine arrows and bolts. Bug Fix: Darkness archetype no longer gives destruction and illusion experience. Bug Fix: Improper spell descriptions. Bug Fix: Azkalin Prison Trapdoor. Bug Fix: Riften Building Door Accessibility. Improvement: Arcane mountain dragon appearance. Bug Fix: NPC gray faces. Bug Fix: Enemy in middle of athletic fields. Bug Fix: Ladder in Azkalin Prison. Bug Fix: Barrage spells properly marked at Expert level. Send me questions, get feedback, and learn about future updates! Subscribe to view new trailers, walkthroughs, and mod showcases! Welcome to the awakening of magic in Skyrim. 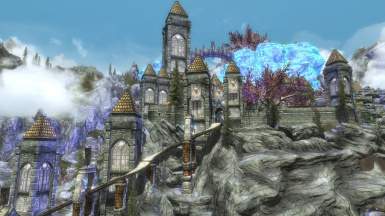 Phenderix Magic World is one of the largest mods available for The Elder Scrolls V: Skyrim Special Edition. The new features added by this mod will completely enhance your experience and unleash hundreds of new roleplaying options. This mod makes some references that could be considered by some to not be lore friendly. Download the patch here, in addition to this mod, to make the mod more lore friendly. This is an optional download. THIS MOD IS DESIGNED FOR MAGES, WARRIORS, THIEVES, MONKS, PACIFISTS, ARCHERS, AND EVERYTHING IN-BETWEEN. This mod will receive frequent updates. These updates will introduce new quests, spells, weapons, locations, and improve existing content. I strongly encourage you to download this mod and check it out. At the very least, please track this page so you are notified of future updates. Use the Nexus Mod Manager for Skyrim SE to download this mod. Make sure to enable the mod after download! To install this mod download the zip file and extract its contents. Copy and paste them into your Skyrim Special Edition/Data directory. If you are asked to overwrite anything select the option “yes to all”. Use the Nexus Mod Manager or Skyrim SE in-game tool to enable this mod's esp file. You will be given a quest directing you to the new locations after installing this mod. Content added by this mod can be bought from new NPCs, found in new locations, or obtained from new quests. Information on how to obtain specific items can be found in the sections below. 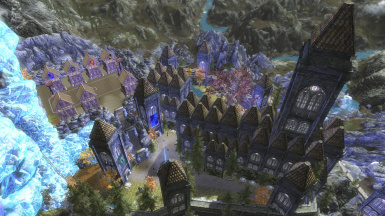 This mod adds two major new locations to the game. In both locations, you will find a variety of new content ranging from new NPCs, boss encounters, quests, and purchasable items. THE SCHOOL OF WITCHCRAFT AND WIZARDRY - a new magical university to explore! Short Description: A university bustling with professors and students. MANANTIS - a new magical town and worldspace to explore! Short Description: Manantis is a small town set in a new worldspace that offers adventurers a variety of locations to explore. This mod adds approximately 300+ new spells to the game. Most of these spells were imported from my mod Phenderix Magic Evolved. 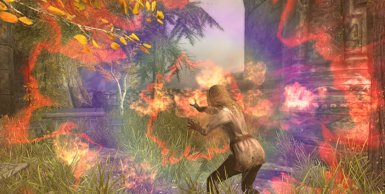 This mod, however, improves upon these spells and adds many new spells to the game. My old mod, Magic Evolved, will no longer be updated. If you wish to receive new spells and updates to existing spells, then please use this mod. 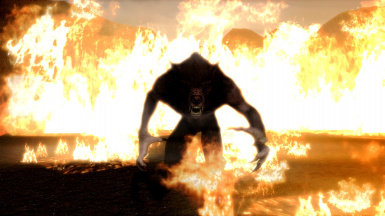 These spells can be obtained from vendors in The School of Witchcraft and Wizardry, Manantis, and across Skyrim. As you level up your magic skills, you will find that vendors offer more spell tomes to choose from. Most spell tomes must be purchased from vendors, however, there are some tomes that can only be acquired by completing boss encounters. If you would like to cheat to obtain the spells added by this mod, there is a cheat chest in Whiterun's Dragonsreach near Farengar. Many of the offensive spells added by this mod scale with enchantments and perks that affect the vanilla fire, frost, and shock magic types. This allows you to use your favorite spells throughout the game to varying degrees of effectiveness. All summons added by this mod can be interacted with and be dismissed or have their stats viewed dynamically. This mod adds 20 new types of arrows/bolt to the game. These new ammo types can be equipped like standard vanilla ammo. Legendary ammunition types only have 1 rank. Legendary ammunition is composed of Rank III arrows/bolts. The Steel Smithing perk is required to craft these arrows and bolts. All new ammo types are sold by vendors in The School of Witchcraft and Wizardry and by vendors in Manantis. They can also be crafted. This mod adds new unarmed elemental weapons that can be used by the player and NPCs. It allows for elemental martial arts fighting. These elements are equipped as normal weapons, like a sword, but the wearer will still appear to be unarmed. Their base damage scales with One-Handed enchantments and perks. Magical damage and visual effect scale as you level up One-Handed. These weapons will level up One-Handed as you use them. After you pass a threshold, elemental damage, and visual effect increases. These weapons are sold by vendors in The School of Witchcraft and Wizardry and Manantis. This mod adds a wide variety of followers to the game that can be found by exploring the new locations. The lore friendly patch for this mod will change the names of the followers found below. Location: Scattered throughout content added by this mod. In addition, there are new items from "Weapons of the Third Era" that you can purchase from the Manantis blacksmith. Improvement: Altered many of the names of NPCs at "The School of Witchcraft and Wizardry". This mod is available for use on PC, XB1, and PS4. There are some differences in the versions released on these platforms. The differences on PS4 arise from Sony's decision to not allow external assets in mods for Skyrim Special Edition. The PS4 version of this mod is currently at version 1.1.2. It is substantially different from the PC and XB1 versions. Additional updates are not expected to come to PS4. Removal: Spells in the bomb, teleport, manipulate archetypes as well as concussive strike spells. Removal: Custom weapons, textures, and meshes from Weapons of the Third Era. Removal: Custom textures used in the School of Witchcraft and Wizardry. Removal: "Arrow - Replicate", "Bolt - Replicate", "Arrow - Divine", "Bolt - Divine". Removal: "Hand - Divine", "Excaliblade". Changes: No custom meshes/textures for legendary weapons or ammunition. Changes: Blood spells do not damage the caster. Changes: Divine spells do not heal the caster. Changes: No dynamic dismissing of summons. Use "Summon - Dispel" to get rid of unneeded conjurations. Q: Does this mod make any changes to vanilla leveled lists? A: This mod edits the leveled lists for spell tomes. If you have a mod that makes changes to this list, load it after (meaning below) this mod. You can still buy content added by this mod from vendors in Manantis. You just won't be able to buy them from vanilla vendors across Skyrim. Q: Is this mod simply a collection of your already released works? 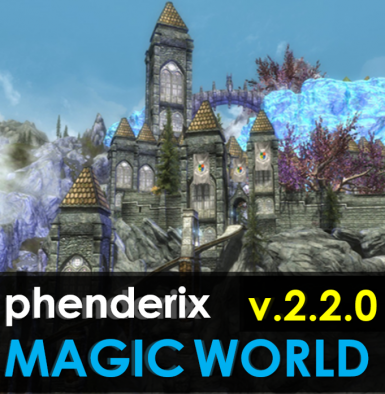 A: Phenderix Magic World does bundle all of my old mods into one package but all of the content added by those mods has been greatly improved and enhanced for this release. In addition, a large amount of new content was created specifically for Phenderix Magic World. Q: Should I continue using your other mods like Magic Evolved, Arcane Archery, or Elemental Fighter? A: No, you should uninstall and delete those mods. They won't be updated anymore. Please upgrade to Phenderix Magic World. This mod adds tons of new content that you should not miss out on. Q: Should I use other mods including content from "Weapons of the Third Era"? A: You can but you may end up having duplicate items with the same name in your inventory. Q: Is this mod compatible with Apocalypse - Magic of Skyrim? A: Yes, they work well together and leave you with a plethora of spells to choose from. Load Apocalypse after this mod. Q: Is this mod lore friendly? A: Yes, it is lore friendly-ish...it really just depends on how you define it. Obviously, these new locations and spells don't exist in Tamriel lore. If you think a certain aspect of the mod is not lore friendly then simply don't use that portion. Q: Is this mod compatible with Ordinator? A: Yes, although further synergy may be added in the future. Load Ordinator after PME. Acquire the March of Oblivion perk for Host spells added by this mod to still function properly. Q: Is this mod compatible with "Insert Perk Mod Here"? A: This mod should be compatible with every perk mod. However, perks that change anything magic related may not affect spells added by this mod. If you would like increased compatibility or synergy with a perk mod, please leave a comment letting me know! Skyrim Nexus User: lolikyonyu - Lolicept Resources - clutter items that make locations much more interesting. Thanks for this resource! I truly hope you enjoy Magic World and realize that mods like this are a massive undertaking. Thousands of hours went into its development. Please see the updates section if you want to help in the development of this mod. I look forward to hearing about your experience using this mod and any suggestions you may have!